Welcome to our first Hudson County store tour! I had to kind of loosen my definition of tour for this group, because some of these stores were so small that I don't know if you could call what I have a tour. But here goes. Latinos is the only Key Food store I visited this day, Key Food store #2116. 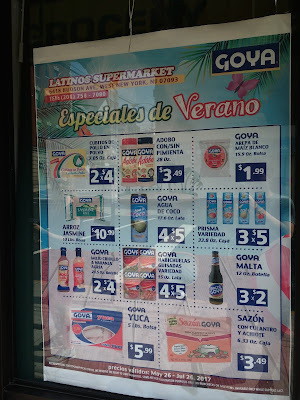 There are two Tropical Supermarkets in Union City, but they're both farther south than I went. 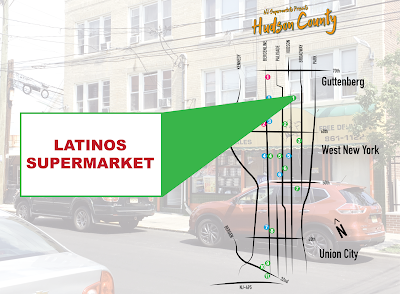 Latinos is a long-standing independent store that formerly used General Trading of Carlstadt, NJ for distribution. It's tiny and obviously made from several smaller storefronts. 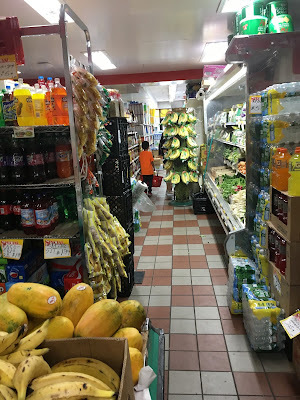 There are three doors along the storefront, but you actually enter in the farthest left, roughly under the word Grocery on the awning (which sorely needs to be replaced). The one under the word "Frescas" leads to apartments above, and the one on the far right under the cow is an emergency exit only, probably formerly the entrance to a different business. This promotional poster in the window is a special ad provided by Goya to independent supermarkets, and also serves as the store's circular. Ahart's was using the same document in Allentown. I find it interesting that at the time of my visit on August 10, 2017, this ad still had not been updated and the store was still giving them out as current circulars. The first aisle opens up to a double-wide produce aisle in the back of the store. Here we're looking back up towards the front of the store from the produce department in the back. Basically I turned around 180 degrees from the previous photo. There's a very small vegetable section on the right here. I like the tile being a little more than the standard white vinyl, but it's incredibly cramped in this store. Latinos was actually one of the last supermarkets I visited that day, and almost EVERY one had these wheel pastas in bulk in the produce department. Looks like they're cooked as a snack food, and are popular in Latin American and India. Packaged meat/cold cuts along the back wall. 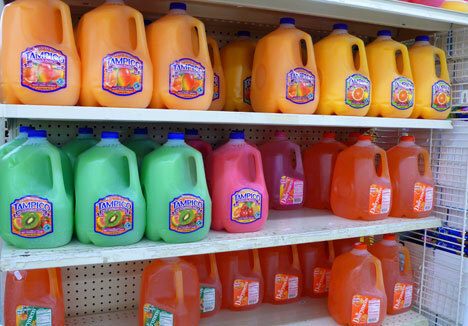 Surprising that this store stocks Poland Spring along the bottom of the case, most use those jugs of Tampico punch (that are nothing like any colors actually found in nature). I guess water is healthier! Quesos and cremas on the other side of the produce department. Here we're looking towards the front of the store from near the back wall. As always, huge service butcher counter in the back of the store. Latinos doesn't have seafood or a deli. Moving into the expansion, into the neighboring storefront. The floor here in the front matches, which I appreciate, but the whole store doesn't quite match. The front of the store is to my right, and the back is to my left. There's a doorway that I'm standing in from the main store to the expansion. Looking from the doorway towards the back of the store. The expansion goes farther back than the main store. Kind of funny that the expansion is as big as or bigger than the original store! Windows along the front wall of the expansion. The break in shelving to the right here is where the doorway into the old store is. This cart, used for storage, caught my eye. Latinos had several Verducci's carts, which makes me wonder if Verducci's was where Latinos is now or somewhere else in WNY, which used to be extremely Italian. Very new freezer cases line the side wall of the expansion. Dairy runs along the back wall of the expansion. There are 2 or 3 checkouts and a tiny customer service counter, with the manager's office along the front wall to the left of the window. The door here serves as both the entrance and the exit. Latinos was one of the less distinctive stores I visited. As usual, good for the (largely pedestrian) neighborhood, but not really outstanding in any way. Not particularly new or old, not particularly clean or dirty, not particularly special. It's easily one of the smallest Key Food stores out there and doesn't really feel like a Key Food. Over and out for this week. Come back on Monday for our next Snapshot!